We asked for the spiced walnuts on the side, which were served warm with hints of cinnamon and paprika. Very tasty. We were impressed by the lovely presentation of the pierogies. The sour cream and compote made a nice, light sauce combination. We managed to share the three pieces among five people, but wouldn’t have said no to one or two more on the plate! For the main course, three of us ordered the Veggie Chili (tempeh, peppers, beans and spices simmered in a rich tomato sauce), while the other two picked the Home-style Chicken Pot Pie (chicken, vegetables and gravy, slow baked and topped with a savory pie crust). As one of the Veggie Chili consumers, I appreciated the hearty lunch portion, and left feeling full and satisfied. 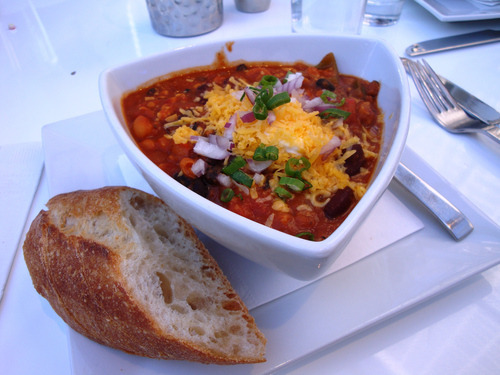 The chili was flavorful as well as colorful, topped with grated cheddar cheese, red onions, and scallions. 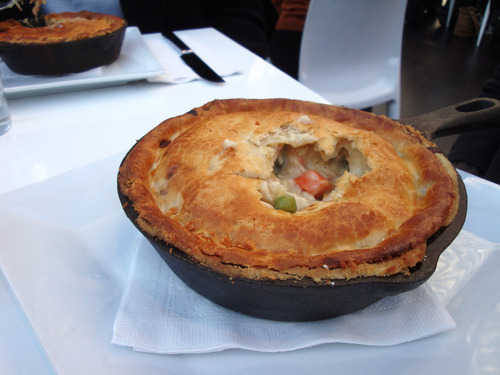 Served in a personal size skillet, the Chicken Pot Pie came piping hot straight from the oven. It was filled with large chunks of white meat chicken, peas, carrots, and celery beneath a flaky crust. Comfort food at its best. 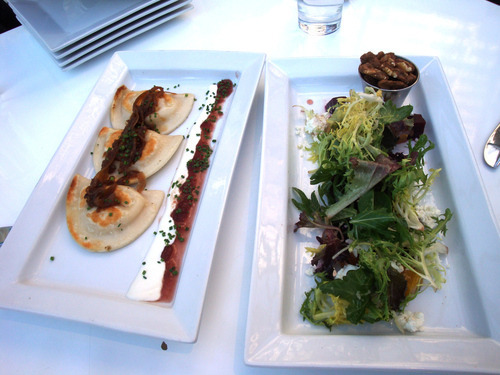 The dish has gotten unsolicited rave reviews from other Bryant Park staff members who have dined at Celsius. 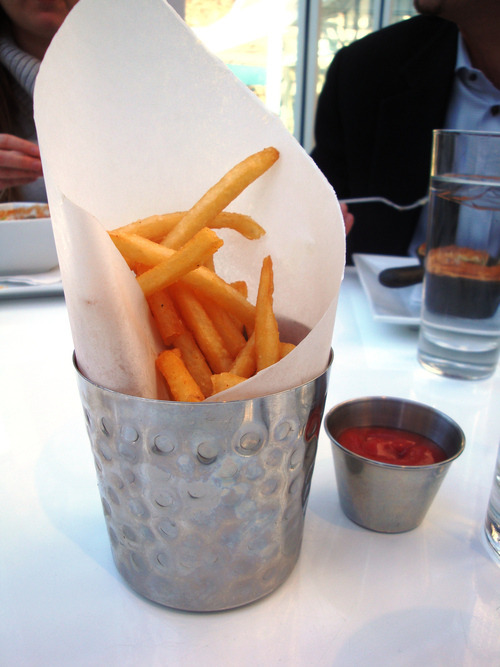 We also shared a perfectly crispy side of french fries during the main course. Lunch left us too full for dessert but the options look good enough to satisfy any sweet tooth. Celsius also boasts a menu of signature cocktails and a full bar with a lively after work scene. The service during our meal was friendly, attentive, and timely, allowing us to return to the office within an hour. If you haven’t tried it yet, now is the time. 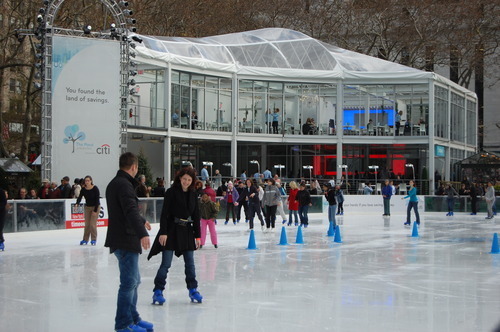 Celsius and The Pond are open through January 24. Click here for restaurant hours, food and drinks menus, prices, and for information about hosting an event at Celsius. That veggie chili looks so good! I love that they included tempeh in it. Must try it this winter for sure.